The Hits - 2 discs and very little to complain about in the bunch but disc 1 is the best. I hate when this happens. 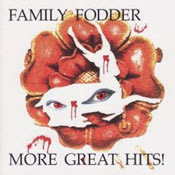 Family Fodder is yet another group I should have certainly heard about before this decade. I heard a few clips via a recent Other Music email and now I am obsessed and in love. The CD arrived at my doorstep today and I am 100% baffled as to how this band didn't make it to the hipster status that bands like Liliput and Young Marble Giants are enjoying in present day. This collection is a complete anthology of the band and don't let the TERRIBLE cover art scare you away. I don't know what they were thinking there. I am short on time and energy to do a full review of this 2xCD today so here is what allmusic has to say - even better, it was written by my friend Daphne who I didn't know wrote for the site, YAY! "Family Fodder was less a band than a never-ending collective of musicians messing with tapes in the basement of a London flat. Begun in 1979 by Alig Pearce, a label called Small Wonder released their first 7" when they still went by the name Te Deum. (Interestingly, the other two singles released concurrently by the label were the first Cure single and Bauhaus' "Bela Lugosi's Dead.") The band was led by odd splices of tape, dub effects, and Dominique Levillain's chanteuse vocals. Influenced by Syd Barrett, the Kinks, and This Heat, Pearce moved his compositions from psychedelics to drones to proto-electronic music full of cut-up location recordings. The band thought themselves to be very serious musicians but the music takes on a light air due to the splicing and humor throughout. The group toured three times between 1981 and 1982. In 1983, Pearce borrowed some of the band's record advance money from their new label, Fresh, to fund another project's tour. The resulting album, All Styles, came out of these diminished funds and was scratchy, ill planned, and home-recorded. It sold only about 100 copies when released. Pearce went on to be a professional accordionist and in 1989 reformed Family Fodder with Levillain, Hobbs, and Wilson. He also tours under the name Johnny Human. With the 1999 reissue by Dark Beloved Cloud, Family Fodder has found a new audience with avant and new wave enthusiasts." There is also a great deal of info about the band here.